A New Map of the Western Parts of Asia Minor Largely Taken: Shewing their Antient Divisions, Countries or People, Chiefe Cities, Towns, Rivers, Mountains etc. 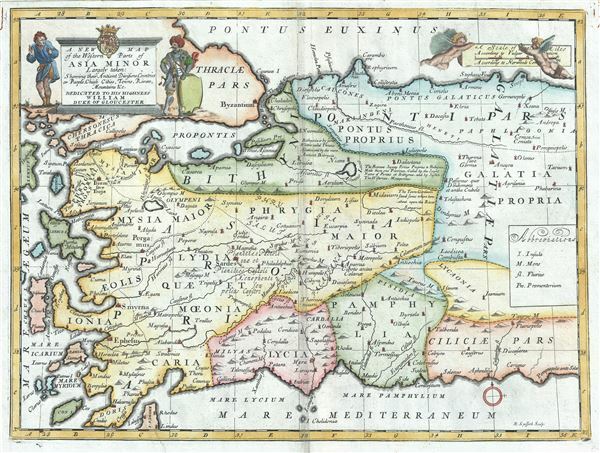 This is a beautiful 1712 map of the western part of Asia Minor or Turkey by Edward Wells of Oxford. It covers the western part of Turkey from the Aegean Sea east as far as central Turkey, noting several towns, cities, rivers, mountains, ancient divisions, etc. The map also contains numerous interesting cartographic annotations. A decorative title cartouche appears on the top left quadrant of the map featuring the coat of arms of the Duke of Gloucester. This, like many other Wells maps, is dedicated to Prince William, Duke of Gloucester and son of Queen Anne, who, when this map was being prepared, was a student at Oxford. Engraved by R. Spofforth and published by T. Bonwicke for the 1712 edition of Edward Wells' Atlas, A New Sett of Maps both of Ancient and Present Geography. Edward Wells (1667 - 1727) was an English mathematician, geographer, and classical scholar based at Christ Church College, Oxford. Well's was trained for the ministry but quickly found himself unsuited to religious life and instead applied for an academic position at Oxford, where he authored numerous well respected works on a wide range of mathematical and scientific topics. He was chosen to tutor the young Prince William, the sickly son of Queen Anne. The two must have been quite close for Well's dedicated nearly all of the maps in his most important atlas, A New Sett of Maps both of Ancient and Present Geography. Sadly, he young prince died in July of 1700 shortly before the atlas was published. Nonetheless, Wells' geography proved popular and was published in number editions well into the 1730s. Wells, E., A New Sett of Maps both of Ancient and Present Geography, (London, T. w. Bonwicke) c. 1712. A New Sett of Maps both of Ancient and Present Geography was published by Edward Wells in various editions between 1701 and 1730. The publication contained some 40 maps all of which were dedicated to Prince William, Duke of Gloucester. Wells tutored the young prince at Christchurch, Oxford and seems to have developed a close relationship with him. At just 11 years of age, William died in 1700 and never had the opportunity to see the published work that he inspired. The atlas was intended for educational purposes with a focus on school use. Very good. Some wear and foxing along original centerfold. Original platemark visible. Professionally flattened and backed with archival tissue. New York Public Library, Map Division, OCLC : 7143148 (1700 edition).